Including these exercises in your gym programme will be very beneficial in the long-term, writes David Last. IF YOU ONLY had 10-15 minutes each day to stretch, do body maintenance or some mobility work, what would you do? I’ve previously suggested how you should structure a warm-up session before your workout. I’ve also highlighted the importance of body maintenance for at least 10-15 minutes of recovery stretching each day. I would prioritise these areas most of the time before getting a workout in. Mobility and flexibility standards are always the first thing I assess when working with a client for the first time. As a trainer I spend a lot of time working with office workers who spend 8-12 hours a day in the seated position. Not surprisingly, most arrive at the gym with poor mobility, lower-back issues, poor posture and a weak core, which makes training and doing simple things like hip hinges, squats, and other staples of a training programme very challenging. Mobility work isn’t generally seen as cool and a lot of the time you won’t see the fitness industry focus on this. The industry rarely sells patience and a lot of the time its attention is on youth and intensity. However, doing basic stretching, mobility drills and listening to your body for areas that need attention is what will really make the difference and help sustain your health and fitness regime in the long term. People often get injured because they neglect mobility work and often have poor movement/technique in high-intensity workouts with a tight and weak body. Below I have highlighted some simple drills that I feel everyone should be doing regularly. Drive your hip forward and back while your knee is planted into the mat on the ground. Your iliopsoas muscle, one of the main hip flexors, is a deep muscle that requires isometric activation to stretch it. Contract your glute and pulse forward and back for 15 reps each side, ideally after raising your body temperature. 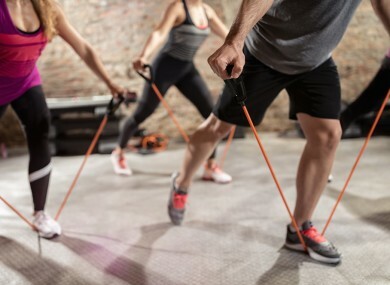 Resistance bands, as well as being portable and convenient, are perfect for doing mobility and core drills. Above I have highlighted three movements which will help your posture, rounded shoulders, tight upper back and tight glutes, one of the primary causes of lower-back issues. These drills will not only improve your posture, movement and mobility but also your performance and body awareness. I’d estimate that 90% of the clients I work with have tight hamstrings, which is generally as a result of sitting down for long periods every day. Inactive hamstrings, hips and glutes can lead to many other issues such as lower-back pain and discomfort. For the stretch, place a band over the middle part of your foot and pulse your foot down for up to 20 reps on each leg. The goal is to work towards reaching that 90 degrees position with a fairly straight leg. Don’t overdo it, get to the range that is just about on your limit and try to hold the stretch for 60-90 seconds on each leg. More detail on these movements can be seen in the video below. Email “5 basic mobility drills that you should be doing regularly”. Feedback on “5 basic mobility drills that you should be doing regularly”.